Okay, I’ll admit it; this is sort of a stretch to be included as a bread per se, because of the low percentage of flour. 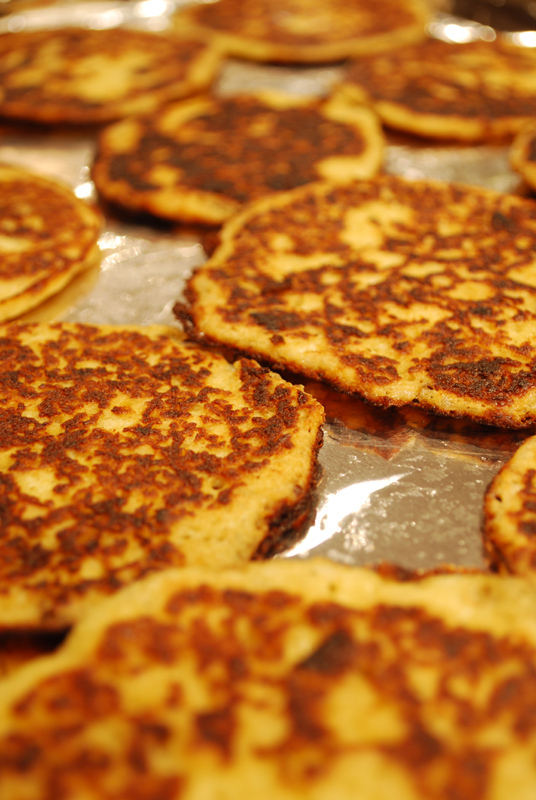 But cut me some slack… it’s a bit tricky to find recipes for bready “pancakes” that don’t cross firmly over into “flatbread” category. Besides, these are so good, you probably won’t care after you try them. I know I didn’t. There is a large percentage of cottage cheese in this recipe, which might seem a little odd at first. It takes the place of any milk or other liquid (aside from the eggs and butter), and makes the batter rather lumpy. But never fear, as any lumps just melt when they’re cooked. What you end up with is a bready exterior with a soft, creamy inside, almost similar to a cheese-filled blintz. You can look at it like a filled bread with the filling mixed into the dough, rather than rolled up in it, if you like. I included nutmeg in this recipe, drawing inspiration from the (very similar) ingredients in a classic béchamel sauce (butter, flour, milk, onion, nutmeg). And, oh my goodness, was that a good idea! In savory applications, a pinch of nutmeg provides a pleasant bakground warmth and gentle nuttiness, one that generally isn’t very noticed until it’s accidentally omitted. It complements dairy beautifully, and in this application it rounds out the flavor of the whole-wheat flour to a T.
These pancakes were delicious as-is, and would make a nice light lunch with a salad alongside. I could just as easily see these as an entrée topped with some pulled-apart rotisserie chicken, or with some slow-cooked pork. Or, if you prefer, serve these with some hearty roasted root vegetables, or a thick vegetable stew. If you’re having a party, make miniature ones and top with shavings of good ham, prosciutto, or crumbled bacon. Delicious! 2. Cook onion in 2 tablespoons butter in a small heavy skillet over medium-low heat, stirring occasionally, until golden brown, about 12 minutes. Transfer to a bowl, then add the remaining butter and other ingredients, and whisk until combined. 3. Brush a 12-inch nonstick skillet with olive oil or melted butter and heat over moderate heat until hot but not smoking. Working in batches, scoop 1/8-cup measures of batter into skillet and cook until undersides are golden brown and tops start to look dry, 1 to 2 minutes. Flip and cook until undersides are golden brown and pancakes are cooked through, 1 to 2 minutes more. Transfer to a baking sheet and keep warm in oven. Brush skillet with butter between batches if necessary. 1. You can certainly omit the nutmeg, or substitute any other herb or spice you prefer instead. 2. Don’t have whole-wheat flour? All-purpose will work just as well. In fact, you could probably substitute any other type of flour with no problem: rye, cornmeal, spelt, buckwheat, etc. 3. If you have a lever-mechanism ice cream scoop, those are perfect for dishing up consistent and properly-sized amounts of batter. Forget pouring, just scoop the batter directly into the hot buttered pan.